Let’s face it, wool rugs aren’t cheap, but they can give you endless years of pleasure and enjoyment. That said, in order to do so, they need to be cared for correctly and this means regular cleaning. Did you know for example that correct care and maintenance can enhance the life of your rug by up to 10 years? 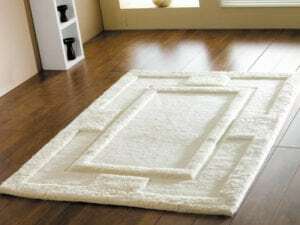 With this in mind, how do you best maintain an expensive rug. Without doubt vacuuming a wool rug is the very best thing that you can do in order to preserve it. Why? Because dirt and debris can collect on the surface and if not removed can get trampled into the fibres. When this happens the layers of debris becomes compacted and starts to grind down the fibres just as if they were being rubbed with sandpaper. Did you know for example that a heavy wool carpet can hold somewhere around half a kilo of particulate per square metre before it begins to appear soiled? That’s a lot of dust! Regular vacuuming removes any surface debris before it has time to settle in. So how often is regular? This depends upon the amount of traffic your carpet gets. For example rugs with light traffic should be good for a vacuum once every one to two weeks. Whereas a rug with medium traffic may need vacuuming 2-3 times a week. Conversely rugs that acquire heavy traffic like those in hallways, may need vacuuming every single day. Wool fibre protector treatments form a protective barrier that sit on top of your rug and repel spills and debris. In conjunction with vacuuming this can prolong the life of your rug considerably. Don’t forget to ensure that the fibre protector you use is compatible with your type of wool rug, so whether it’s woven, tufted, or shag, buy the right fibre protector treatment for the right rug. No matter how much protection you use and vacuuming you do carpets eventually become dirty. They’re made to be walked on after all! Granted this can be eased by practising tasks like removing shoes when entering a home, but this mightn’t always be possible. For this reason it pays to get your rug professionally cleaned. Just like vacuuming, the time frame between professional cleans may differ from rug to rug depending upon use. This can range from every 2-3 years for rugs with little use, to every 6 months for rugs with heavy traffic. These 3 factors combined should see that your rug not only looks great but will last for many years to come. 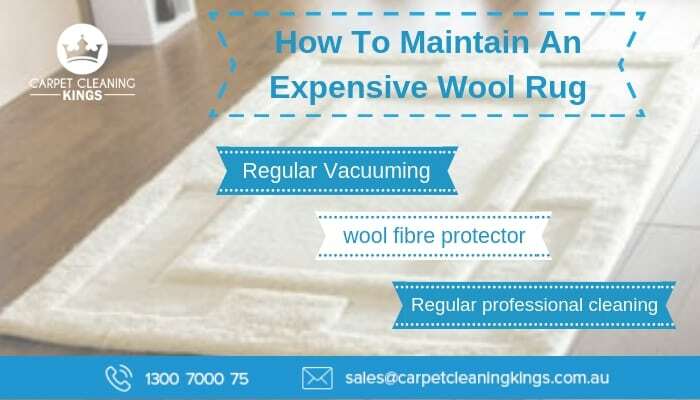 For further information about maintaining your wool rug, or to book a clean, contact Carpet Cleaning Kings. We’ve been serving the residents and businesses of Brisbane, the Gold Coast and the Sunshine Coast for many years. As such we have vast experience in dealing with all types of carpets and rugs. As a result you can rest assured that when you hire us, you’re in safe hands. Contact us today on 1300 7000 75 and put us to the test.